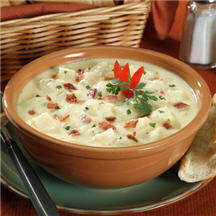 CooksRecipes has quality, kitchen-tested recipes for potato soups that you can count on for successful deliciousness. 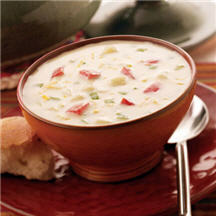 This creamy baked potato soup is sure to warm you up on a cold day. 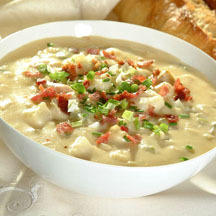 Perfect for cool, fall evenings, this thick and hearty soup offers robust flavor and comforting warmth the whole family will enjoy. This flavorful soup is hearty enough to be eaten as a meal on its own, or as an accompaniment with a grilled cheese sandwich.